As of the Kendo UI R3 2016 release and in addition to the Insert Table tool, the user is now able to add and configure tables by using the Table Wizard dialog. Open the Insert Table tool. To open the dialog, click the Table Wizard button. Configure the table that is to be inserted. Select the table or the table cell to edit. Click the Table Wizard tool in the toolbar. 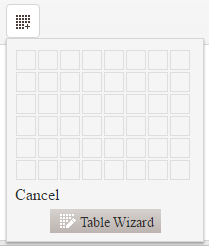 Even without using the table wizard dialog, you can resize the table rows and columns by dragging the cell border with the mouse. Table—The available options for the table element. Cell—The available options for the selected cell or all cells in the table. Accessibility—The available options related to accessibility. Width—Changes the width of the table (in pixels, em, or percent). Height—Changes the height of the table (in pixels, em, or percent). Columns—Defines the columns of the table. Rows—Defines the rows of the table. Cell Spacing—Specifies the space between the cells (cellspacing attribute). Cell Padding—Specifies the padding in the cells (cellpadding attribute). Alignment—Specifies the text alignment in the cells. Background—Specifies the background color of the table. CSS Class—Defines the class names for the table element (white space-separated). ID—Defines the id of the table element. Border—Defines the border size (in pixels only) and color. Border Style—Defines the border style (none, hidden, dotted, dashed, solid, double, groove, ridge, inset, outset, initial, and inherit). Collapse borders—Adds an inline style to that table element with the border-collapse: collapse rule (border-collapse property). Select All Cells—Applies the changes to all cells in the table. Width—Changes the width of the cell or cells (in pixels, em, or percent). Height—Changes the height of the cell or cells (in pixels, em, or percent). Cell Margin—Defines the margin of the cell or cells. Cell Padding—Defines the padding of the cell or cells. Alignment—Specifies the text alignment of the cell or cells. 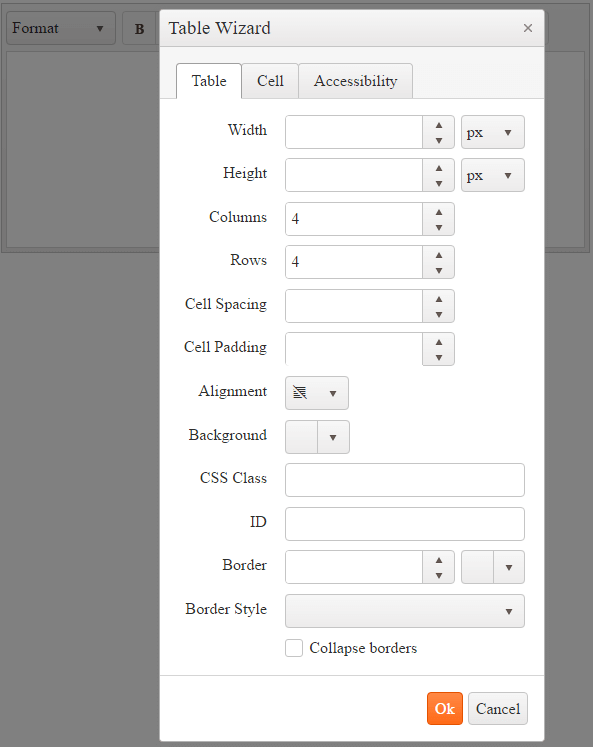 Background—Specifies the background color of the cell or cells. CSS Class—Defines class names for the cells (white space-separated). ID—Defines the id of the cells. Border—Defines the border size (in pixels only) and color of the cells. Wrap text—When unchecked, applies a white-space: nowrap style to the cells (white-space property). Caption—Adds a caption text for the table. Alignment—Defines the text alignment of the caption. Summary—Adds a summary attribute with the value defined to the table. Associate cells with headers—Associates the cells with the header id attributes. For more information on using id and header attributes, refer to the article on using id and header attributes to associate data cells with header cells in data tables).